Constructed on the site of a former car park in west London, Sky UK’s prestigious new 5 hectare campus boasts state of the art office space, TV studios, production facilities, research and development zones, health centre and cafes. The site is now the centre of operations for the Sky organisation in the UK and is surrounded by a landscape that is intended to bring a sense of joy to people’s lives – where staff can relax and socialise in a beautiful environment which is also a rich habitat for wildlife. 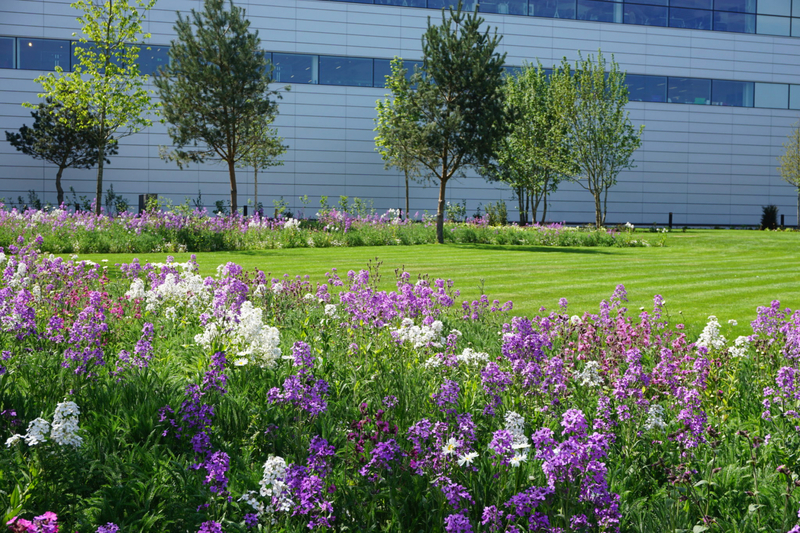 Pictorial Meadows were originally contacted about the project by URBAN – a leading Landscape Architecture practice responsible for many prestigious projects in the UK and overseas. 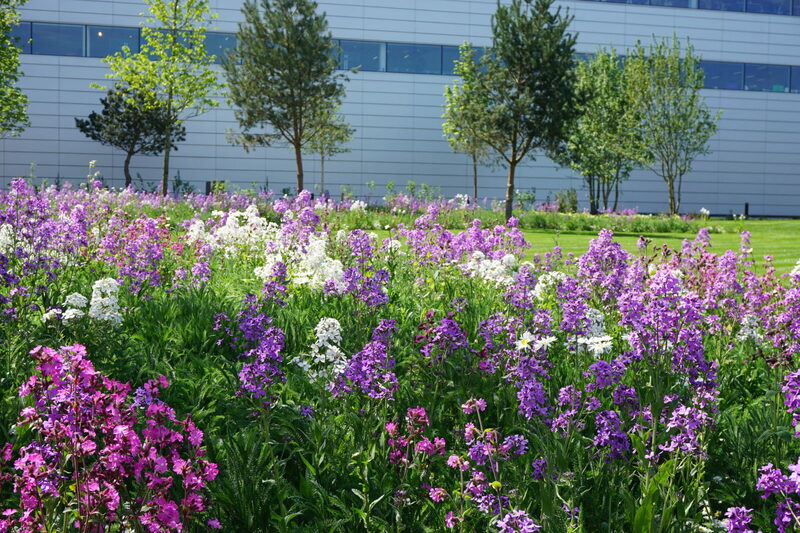 They had been tasked with designing the outside space of the new campus with a brief based on a contemporary English garden style that would give interest throughout the year and included the requirement for a visually dynamic and sustainable meadow. The meadow not only had to be stunning, it also had to be quick to establish and low on maintenance. There were also quite distinct areas on the campus which needed a meadow which would be tolerant of light shade and another for the more open, sunny areas. Following a consultation visit to the site and a series of drafted proposals the final selection of meadow types was made – Woodland Edge for the more shaded areas and Purple Haze for the open areas. 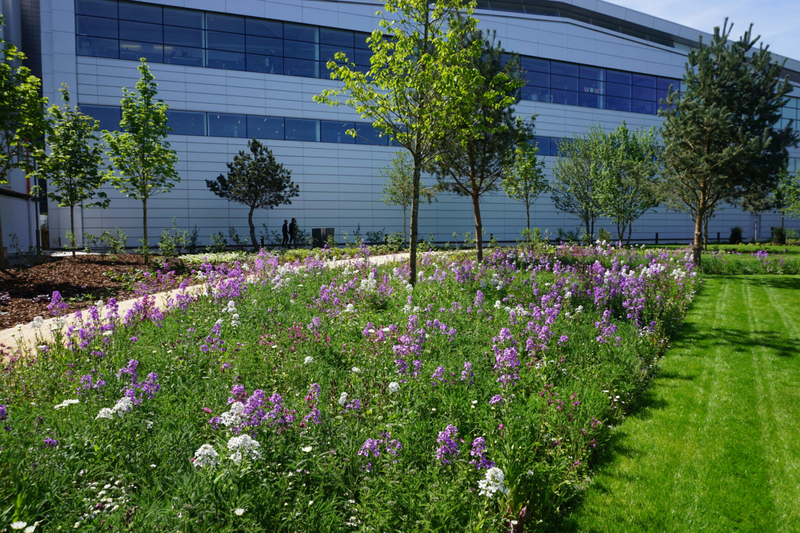 The other requirement from the URBAN team was that the meadow had to be ‘established’ for the planned opening in the summer of 2016 so the only feasible way to achieve this requirement was to use PM Turf. This would enable very quick establishment of the meadows and allow them to blend in harmoniously with the rest of the planted landscape which included a 250m ecological corridor, over 100,000 individual plants and 264 new trees. 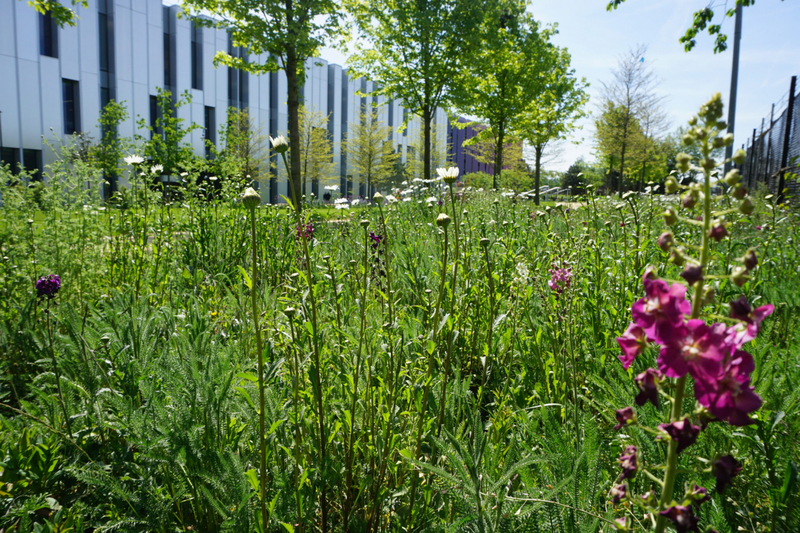 Pictorial Meadows supplied over 2,000 square meters of PM Turf to the campus and within a few weeks the meadows had established and created amazingly floriferous areas of the landscape where bees, butterflies and other pollinators congregate – along with the many lucky Sky staff.